This week, I've been feeling sluggish and down. Short-tempered and sad. Dragging my heels over every little thing - from making the smallest decisions to getting work done. "On Tuesday night, I took a walk and there were several baseball games going on. Walking past the maybe-seven-year-olds, a ball was hit to right field and the young kid fielded the ball and stood there. All the kids and parents were yelling at him, “Throw it to second. Throw it to second. Throw it to second!! !” The kid dropped the ball and threw his hands in the air! shook his head. I laughed. Don’t you feel like that sometimes??? Like everyone is telling you to do this ONE thing and you can’t. You just throw your hands in the air and shake your head? The humility and simple reminder to be - just be yourself. Be in the moment. Eventually he put his glove back on and picked up the ball and threw it to second. Sometimes we all need a little time." It was a reminder that, once in a while, we should give ourselves permission to drop the ball and throw our hands in the air - but also to (eventually) pick it up and throw it to second. In our own time. So, here's to dropping the ball. Second-hand shopping has always been a huge part of my (shopaholic) life. Long before it was "cool" to do so, my mom and I would raid Value Village (a large second-hand store in my hometown) on "99 cent Mondays" and return with bagfuls of clothes and books, much to my dad's horror (because we never seemed to get rid of anything either). Although living in London has changed my style, it hasn't changed my shopping habits (though I'm still trying to change the way I spend my money because of this dreaded spreadsheet). And while I enjoy the thrill of a Zara purchase (or four) as much as the next person, and you'll regularly find me in COS admiring soft pleats and boxy shifts, approximately 20% of my wardrobe is purchased second-hand, via a mix of eBay, consignment stores, and our local community sell or swap Facebook group. With glamorous social media accounts enticing us to "buy, buy, buy!" and want "more, more, more!" (guilty as charged), it's too easy to fall into a habit of constant consumerism - buying into the newest trend (for me, it's oversized sleeves and off-the-shoulder frills, at the moment) or aspirational item (I am stupidly obsessed with that Gucci belt in everyone's Instagram feed). For me, shopping second-hand achieves two things: 1) I can buy labels I'm reluctant to pay full price for (like the cashmere Equipment sweater I'm wearing above or my Muubaa leather jacket) at a fraction of the price; and 2) I'm recycling clothing, which is better for the environment. I also like knowing that I'm giving a piece of clothing a new life. I encourage my friends to "shop in my closet", as my best friend calls it. Friends who visit often leave with a handful of clothes including French Connection shorts (remember those, Rebecca?) or Gap dresses. I'm not professing to be perfect; to be the "conscious" shopper. Far from it. I regularly find myself walking up to the H&M till like a robot, handing over my card like an automated machine and walking out with some slip of a polyester thing, without having any recollection of how or why I bought it in the first place (thank goodness for return policies). But for me, the thrill of a new, store-bought purchase is equivalent to the swell of joy I feel when I become the new owner of an item that has significant or sentimental value. Recently, I bought an amazing, vintage Levi's jacket (with actual, authentic distressing that appeared naturally over time) from a woman in our local sell or swap Facebook group. Approximately nine minutes after her post appeared in my Facebook feed, I typed as quickly as possible to secure my place in line. The lady ahead of me ended up passing because of the holes in the sleeves, but I punctuated my reply with two exclamation points as I wrote, "Yes, please!! For the holes!!" The seller, a lovely woman who met me with the jacket at the tube station's gate so I wouldn't have to trek to her house, lamented parting with an item that had seen her through countless concerts and parties in the 80s, but now no longer fit. I assured her that the jacket would be given a new, much-loved life - and it has. I've barely taken it off since I got it! The reverse can happen too: we recently sold an indoor/outdoor coffee table through the same Facebook group - a table that John had painstakingly sanded and varnished himself when we bought it together for our first flat over 7 years ago. I was sad to see it go, but we didn't have room for it. When the man who bought it arrived to collect it, I was pleased that he was around our age, seemed really nice, and that he had planned to put it in his newly remodelled garden. I mean, not that any of this mattered (it's just a table! ), but I loved knowing that a piece of furniture that we had once loved and cherished was going to someone who would really enjoy it (having said that, I saw it for sale a few weeks later as it didn't quite work for the new owners - oh well!). I guess what I'm trying to say is that, our possessions are a part of us. They carry memories of the person we were at the time we bought it (the denim jacket) and the thoughts, feelings, and events we experienced when we owned them (the coffee table). They're reflections of our personality and taste. And that's why shopping second-hand can be such a special experience. Have you ever bought a second-hand item? What was it? I'd love to know! On the busy, dusty streets of Marrakech, we would often pass doorways leading to beautiful riads with stunning courtyards filled with lush, tropical plants and fountains. And every time I stole a peek at these courtyards as we hurried past, escaping the call and beckon of an interested souk stallholder, I'd be surprised by this sudden and magnificent display of light and greenery. The exact same feeling struck me as I arrived at Cigalon restaurant on Chancery Lane the other night for our 4-course Provencal dinner experience, organised for us by Truly Experiences, a company specializing in authentic, curated gift experiences - from wine tastings to spa days. From the street, the restaurant's exterior seemed unremarkable, but after shedding my coat at the door and being led into the stunning dining room, I understood why the team at Truly had pronounced this dinner as a gastronomic "experience" rather than, well, just another meal out. Natural light pours in from the greenhouse-like ceiling, meaning the space requires almost no lamps or spotlights when daylight is available (which happens to be at 6:00 pm and onward at the moment, with British Summer Time). Guests dine under gigantic banana leaves and hanging plants, creating the illusion of sitting in a garden. The interior decor is a combination of modern rustic: sophisticated in its color palette of taupes, pale purples and greys, but remaining true to its Provencal roots with bleached wood accents and a natural stone bar. As daylight fades, the tables are lit with candles and decorated with pots of succulents, rather than fussy floral arrangements, making the Cigalon one of the most Instagram-friendly restaurants around. And although Truly offers a variety of French dining experiences, this one in particular is rather special because of that dining room. But what I loved the most were the spacious semi-circle booths in the center of the room - perfect for two people or more. Strategically placed in opposite directions, it felt like dining in a semi-private space, which felt so special! We began our Provencal-themed dinner with a delicious cocktail and a potato terrine with peas and baby gem lettuce, which both John and I loved. It tasted like French country cooking: hearty and rich. The peas were slightly underdone (which I assume was intentional), so they popped in the mouth with a little crunch - a great contrast to the layered potato terrine. To follow, I had the spring vegetables and seaweed cocotte while stealing bites from John's soft poached egg with bacon, tomato and pickled mushrooms. I loved the sourness of the mushrooms coupled with the runny egg yolk and salty bacon. We both ordered the crispy lamb belly with Borlotti beans and wild garlic, but were so amateurishly defeated by this point, we could only finish about half of it! In truth, I'd been holding out for the amaretti and lemon cheesecake dessert, which our waitress couldn't hide her enthusiasm for: "It's amazing," she enthused. "And, so cute!" she added, conspiratorially. When our desserts arrived (John had opted for the dark chocolate Moelleux and rhubarb sorbet), I saw that the cheesecake was indeed very "cute": in keeping with the rustic theme, it was served layered in a sweet little jar, with a tiny dessert spoon on the side. Polishing it off in no time, I snuck bites from John's plate, and ended up finishing his dark chocolate Moelleux, which was filled with wonderfully gooey, yet light, chocolate cake. We left the restaurant arm-in-arm on our way to the tube station, and I thought how nice it was to have a date night at a restaurant other than somewhere local, for once. I love the pubs and restaurants near our home, but this dining experience felt like something a little out of the ordinary; a breaking of habit. Thanks to the wonderful and friendly team at Truly Experiences for organising such a unique and unforgettable evening for us. I've now added Cigalon to my list of hidden gems in London - and I wouldn't hesitate to take my family or friends back for a memorable lunch or dinner. Our Truly experience at Cigalon restaurant was complimentary. All opinions are my own. Book your own unique and unforgettable Truly experience here. With a full-time job and freelance writing work on top of this blog, I've been pretty hard to pin down lately. But I had two breakfast meetings last week and they worked so well for my schedule. I'm an early riser anyway, so getting up at 5:30 or 6:00 a.m. before heading out for a 8:00 a.m. breakfast isn't an issue for me and, as long as it's on my way in to work, I'm at my desk at the same time I'd normally be in. One of my breakfast meet-ups was at The Kitty Hawk in the City, with Claire Menary, a photographer and blogger with the most beautiful Instagram feed. I love meeting fellow bloggers and creatives, especially those whose work I love and find inspiring. We met for a delicious breakfast spread at The Kitty Hawk's restaurant last week (not to be confused with its smaller, coffee bar and patisserie next door, which is perfect for a grab-and-go breakfast) amongst its modern industrial interiors (and gorgeous tiled entrance) and large, floor-to-ceiling windows. Despite its location in the City, The Kitty Hawk doesn't feel too impersonal or corporate (despite the presence of suited-and-booted businessmen taking a table in the corner). The pretty, floral crockery helped too, along with the simple thistle and cow parsley arrangements on the table, which added a soft, homely touch to the restaurant. They've got a range of delicious hot breakfast fare on the menu, with highlights such as eggs benedict, poached smoked haddock, scrambled eggs with smoked salmon and soft-boiled eggs with "soldiers" (i.e. long-thin sliced pieces of toast, for non-British readers). Had it been a little later (say, brunch hours), I probably would have ordered the eggs, but it seemed a little heavy for me at that time in the morning and I was craving something sweet, so I decided to try the toasted pecan and banana flatbread, which was basically like a sweet calzone! An ingenious idea, and one that could only have been improved with a slathering of Nutella. Drizzled with local London honey and topped with pomegranate seeds and fresh mint, it was a delicious and filling way to start my day - without being too heavy. Claire's fresh fruit salad and granola looked equally tasty (not to mention, healthy), and it was great to chat to someone who shares so many of the same blogging highs and lows as I often experience! I've always had a little trouble coming up with restaurant ideas in the City (I return time and time again to my favorite, Duck & Waffle, but sometimes I'm after something a little more ... low-key than panoramic views of London), but I've now added The Kitty Hawk to my arsenal of restaurant recommendations, should anyone ask. Thanks for the delicious breakfast and wonderful company, Claire! Happy Easter! Technically, I made these on Friday, but oh well. This recipe is a great way to use up any leftover hot cross buns you might have after Easter Sunday - and it's so quick and easy! I'm pretty haphazard when it comes to cooking, so you'll notice that my recipe has a lot of "whatevers" in it. Whatever. Slice each hot cross bun in half. Combine the egg and the milk and mix. Pour the mixture onto a plate. Heat a square of butter on a non-stick frying pan (or skillet, whatever) on low heat. Using a pair of tongs or chopsticks (I used the latter), dip each side of your hot cross bun slice into the egg and milk mixture, taking care not to soak up all the mixture with the bun. Place each slice gently into the pan and cook for 2-3 minutes or until the bottom begins to lightly brown. Turn it over and press the other side into the pan, cooking for 2-3 minutes. Serve with a dollop of Greek yoghurt or creme fraiche or whatever tickles your fancy, and top with fruit and/or a drizzle of honey. Dust with icing sugar if you're planning to post on Instagram. Just kidding (but not really). What do you think? Would you try this recipe? Confession: I'm not really a huge fan of hot cross buns - John loves them, so I buy them once in a while, but even I had to admit that this version of French toast was pretty tasty! I hope you have a lovely Easter Sunday. We're having friends over for a roast lunch, and I'm making croissant bread and butter pudding for dessert - another hybrid! All hotels should be judged by how they make you feel when you're suffering from the fever, aches, chills, and the - ahem - non-stop trips to the bathroom as a result of a stomach bug you picked up on an overnight camping trip in a Berber tent after having trekked for 3-hours on camel-back. The beginning: we were deposited outside the walls of the Medina in Essaouira by the friendly driver who'd picked us up at Ksar Char-Bagh in Marrakech, as arranged by our riad in Essaouira, Riad Dar Maya. A little bewildered and confused (mostly because I'd missed the French for, "Mohammad will take you the rest of the way") as our bags were being unloaded from the back of the car, a short, older man with a weathered face suddenly appeared with a cart, lifting our luggage into the cart and gesturing for us to follow him. We did: through the winding streets of the old town, like a miniscule version of Marrakech, with crepe vendors and men selling raffia shoes and baskets and Berber rugs casually hung, pinned, and draped from doorways and walls lining the streets. We followed this small man, who expertly manuevered his way past tourists, mopeds, and small children until we came to a door (which looked like every other door) down a narrow alley and were received into Riad Dar Maya, a chic riad with five rooms, owned by British expat, Gareth Turpin. At first glance, it was simpler I had imagined it, but cozy, neat, and well-decorated in neutral beige and brown tones. The rooms are simple but spacious, with bathrooms that resemble hammams (or a set from the 90s children's game show, The Crystal Maze) - featuring steps into a shower complete with columns and a deep-set, angled tub. Downstairs, the reception area opened to a small lounge and a courtyard, where seagulls flew overhead and gave their occasional, distinctive call. One night, when I was sitting in the courtyard sipping mint tea (as you do), a pair of men's swim shorts that had been drying on the balcony above fell on my head (this was after a seagull had already unloaded the contents of its bowels in my hair at the port earlier that evening, mind you). All I heard was a whoosh, then darkness as the shorts enveloped my head. I simply tipped forward and allowed the shorts to fall to the floor in utter disgust, but John, who took two beats to consider what had actually happened, proceeded to laugh the loudest and most high-pitched laugh I've ever heard him laugh in my life (we've been together for 12 years). It wouldn't stop. We spent our days roaming the narrow alleys of Essaouira, discovering new doors to take photos in front of, and making our way down the windy beach (it's known as the "windy city" of Morocco thanks to its position on the Atlantic coast) for salads and sandwiches at the surf school and restaurant, Ocean Vagabond. The riad's rooftop jacuzzi and sun loungers meant that we could relax there in the afternoons if we didn't feel like venturing out, and the breakfast "at any time" policy translated into "sleep in for as long as you like" - something we took advantage of on our second day there. But soon becoming a bit restless of the same streets, and the same routine of waking, grazing, reading, napping, we explored the idea of a camel ride into the sand dunes, followed by an overnight stay at a Berber camp - an idea which was solidified when Abdel, the hotel manager, booked it in for us and we went the next day to the ranch, which housed horses and camels. The trip itself was fantastic - and it turned out to be just the two of us, which made it all the more special (not to mention less stressful, since it was my first camping experience ever and I suffered a bit of insomnia for the first part of the night). I did note that the camp had no running water and lamented the fact that I'd left my Wet Wipes and hand sanitizing gel at home, but I was careful to only pick up any food items with a napkin and to not eat fresh fruit, etc. I didn't make too much of it when my stomach began churning that night, chalking it up to nerves, but by the evening after we returned to the hotel, I'd begun to have a fever and was feeling generally unwell. Then, the trips to the toilet began and, well, that was about it. John was ah-mazing, running back and forth between the riad and goodness-knows-where to source litres of bottled water and rehydration sachets for me, before finally going to the pharmacist, who simply laughed and handed over some antibiotics when John explained what had been happening. Throughout this time, the staff at Riad Dar Maya were fantastic at helping me feel more comfortable - offering to fetch medicine and water on our behalf and, when I felt up to eating again, making a bowl of plain white rice for me as it was all I could stomach. Thank goodness for those antibiotics though, which I was skeptical of taking at first, but had an instant effect and allowed me to get on the plane back to the UK without freaking out too much. And, because the riad felt more like a house than a hotel, I felt a little bit better about recovering there, rather than feeling desperate about wanting to get home (although, with a high temperature, I just stopped caring about things in general altogether!). Have you ever been sick or ill while you were on vacation? How did you cope? Away from the hustle and bustle of the old town, a short distance from the caramel-colored walls of the Medina, and smack dab in the middle of an endless grove of palm trees, is Ksar Char-Bagh - a Relais & Chateaux hotel in the Palmeraie district of Marrakech. We chose it as our base for the two days we were spending in Marrakech for its Alhambra-inspired architecture: marble columns, a fountain in a reflective pool at the entrance, and pretty purple wildflowers leading to the reception made it look serene and still in a city known for its chaotic nature. On our arrival, we were handed a chilled flute of almond milk infused with orange blossom - a drink that instantly refreshed and lifted my spirits, after a rather punishing (early morning) flight from London that saw us delayed for over an hour because the plane door wouldn't close properly. Still, we were finally here, and as we were shown to our suite, I couldn't help doing a little jubilant dance on our private roof terrace once the hotel manager had disappeared from sight. Offering a sweeping view of the hotel's pretty fountain and the palm tree forest as far as the eye could see (and the Atlas mountains beyond that), the terrace was dressed with a low Bedouin-style tent, with white gauze curtains that flapped gently in the breeze and lived-in Kilim rugs and cushions. In the room, a large fireplace stood in the corner of the entryway, which we used one evening to keep off the chill - it was a treat to watch a movie by the fire! The hotel's grounds are beautiful - from the palm-tree lined pool to the "hidden" reading room and the floor-to-ceiling glass windows of the main dining room (which sparkles at night when lit with candles), it's picturesque at every turn. And with only 15 suites, we seldom ran into other guests, so it felt wonderfully secluded and private. We sat down with the concierge, Youssef, the evening after we arrived, to create a bespoke itinerary for a half-day tour with a guide. I felt intimidated by the souks in the Medina, but wanted to have a go at bartering for rugs (naturally), so having a guide seemed to make sense (1,200 dhs, including transport, for a half-day tour). Our guide, Latif, was fantastic, and stepped in to help us bargain when he saw us struggling, and I left with a couple pairs of buttery leather slippers, a pouffe, and a Berber rug. It felt downright luxurious to be able to collapse in a heap by the pool on our return from the dusty souks and a day of exploring other sights of Marrakech (including the Secret Garden and the Ben Youssef Madrasa), but upon closer inspection (i.e. an actual dip in the pool) revealed a severely neglected pool bottom, with large areas of cracked tiles (which were not only unslightly, but also dangerous). The poor maintenance of the pool put a bit of a damper on our stay, as swimming is one of the things John looks forward to the most on our holidays. We mentioned this on our departure, and were told that inclement weather had delayed repairs to the pool. I hope it gets fixed soon, because it's a shame not to be able to swim in it - the shimmering water looks so inviting from afar. One thing noticeably absent from our room (which must be customary in Morocco, as it wasn't in our riad in Essaouira either), was a kettle and coffee/tea making accessories, which would have been gratefully received in the evening as, well, it's nice to have a cup of tea before bed (or first thing in the morning)! I did love the fresh roses, smoothie, and strawberries placed in our room on our arrival though, which were lovely touches and made us feel "at home". Dinner at Ksar Char-Bagh, though delicious, and gorgeously laid out in the candle-lit dining room (with a thick Berber rug underfoot, of course), was quite meagerly portioned: I had a tender, plump fillet of fish (sea bass, I think it was) that was finished in five, or six mouthfuls. Had I known, I would have ordered a starter. Instead, I never said "no" to extra helpings of bread. By 9 pm or so, having bedded down for the evening, my stomach began to grumble and I found myself reaching for the biscuits I'd stashed in my bag from the flight over. Despite this, and despite the neglected state of the pool, I was ultimately won over by the regal beauty of Ksar Char-Bagh and the helpfulness of its staff. Would I return? Only if the pool was restored to a sparkling gleam and the chef reconsidered the menu. If you're heading to Marrakech this year, I'd recommend taking a peek at Ksar Char-Bagh's pretty, self-contained suites for a long weekend of lounging and relaxing. On weekends, I like to wake up early. Like, 6 - 7 a.m. early. I creep out of bed, so as not to disturb John (who needs all the sleep he can get after pulling 13-hour work days during the week), my fluffy bathrobe trailing behind me as I go. From there, I make myself a cup of peppermint tea and pick up some laundry on the way, not bothering to fold it neatly, but throwing it in a basket instead to be put away later. If our cleaner's not coming that morning (she usually lets herself in on a Saturday morning, once every other week), I like to potter around the kitchen, washing up dishes from the night before or straightening things out on the counter and recycling old mail. Then, I sit down to write. I open the curtains in the living room and the French doors leading to our garden, and I put my thoughts down - thoughts that have gathered strength and momentum in the corners of my mind during the working week. I keep writing and writing until the inevitable text comes from upstairs a few hours later: "Tea", it reads. A single plea, usually followed by an emoji: a koala looking forlorn, hugging a bear to its chest or a yellow blob, with "zzz" being emitted from its sleeping face. So, I boil the kettle again and make a cup of Yorkshire Gold with just the right amount of milk, and I bring it up two flights of stairs to the King, who is either sitting up, reading the latest BBC news on his iPad, or only managing to snake his arm out of the duvet to reach for said cup of tea. At some point, he'll pad downstairs and I'll cry out, "Oh no! I'm coming back to bed!" as I scramble upstairs in my fluffy robe and he shouts, "Too late!" behind him before throwing open the French doors to inspect the newest plant life in our backyard. I sulk until he comes back to bed before announcing, "I'm hungry and there's nothing to eat," pointedly. And he'll suggest muesli and I'll make a face and decline and he'll make bacon and poached eggs and toast instead. Before long, our local "village" market will open and I'll take my sunglasses and straw basket and pretend to live in France, before heading up to the market in a torn denim jacket and Supergas to buy a loaf of our favorite sourdough bread. I'll probably buy some flowers to photograph and attempt to write engaging captions on Instagram like, "Happy Saturday! What are you up to this weekend? We're just having a quiet one and enjoying the sun." Maybe we'll go to Epping Forest. Maybe we'll go shopping. Or maybe we'll go to the garden center. I cringe at calling it domestic bliss, but it really is. My weekends feel so precious; so important. My work week is full of people demanding my time, my energy, my space. This weekend time is mine. I have to protect it. Hold it close. Once, I was flattered and simultaneously insulted when John called me a "home girl". "You're a home girl, aren't you?" he said, reaching over to affectionately fluff my hair. "You like to be at home." "No!" I spluttered in protest. "I like to ... do stuff. But ..." I continued cautiously. "I like to be at home too." He laughed. "Me too. I like to be at home too." Around the same time I was commissioned to write a feature on the East London food scene for a travel magazine, I suffered my first real case of "writer's block". Prolonged periods of reading too many blog posts and Instagram captions, leaving inane comments like, "Stunning, babe!" "Looks so cute, love!" (I mean, there's only so much you can say about a frill-sleeve), left me paralyzed by the fear that I was incapable of writing anything of substance. When I thought about how to describe a plate of food, for example, or a restaurant's decor, the only adjectives I could call to mind were, 'amazing', 'stunning' or (the worst yet) 'chic'. That's it. 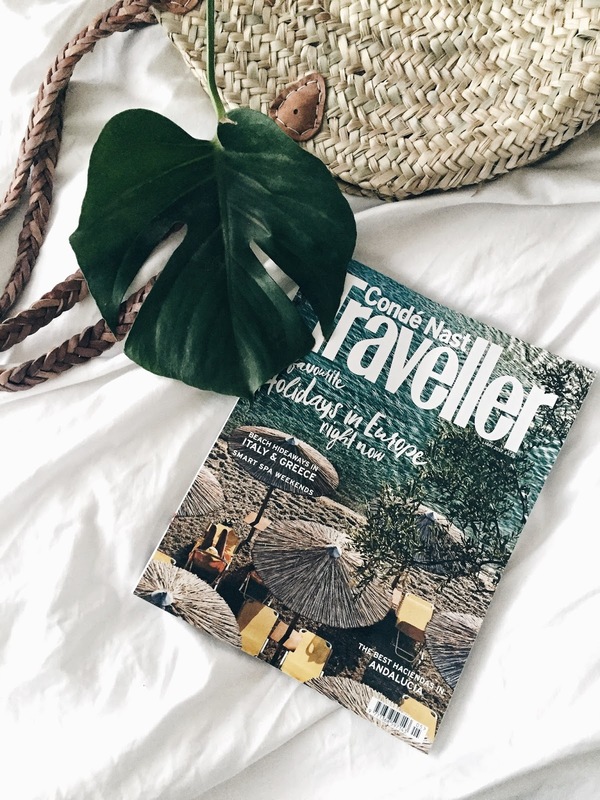 As the magazine's deadline loomed over me, I became desperate, snatching the most recent issue of Conde Nast Traveller and analyzing every single adjective used by the writers to describe dishes, restaurants, and hotels. So desperate, I remember stealing a copy of the Easyjet in-flight magazine from the seat pocket on our flight over to Reykjavik and flipping to the food section, reading - no, memorizing - the articles' choice of words; the pace, the flow. And the whole time, this vicious voice sneered in my mind: "You're not a journalist. You're not a writer. You don't count. Do you have a journalism degree? I didn't think so. These people are trained. They're professionals. They know what they're doing. You don't." I stared at the profiles of the Conde Nast Traveller contributors in bed, wondering what their CVs were like, half-ready to pounce on LinkedIn to stalk details of their formal training and experience. 'A Conde Nast staffer for years, Francesca now writes for ...' read one bio, showing a portrait of a beautiful woman with windswept, black hair smiling ruefully into the distance as if to say, "Oh, look at me. Just here. You know, a travel writer. Doing that thing I love. Jetting off to far-flung locations on the company's dime and being a generally crafty wordsmith." The Sunday before the first draft was due, I'd managed writing a few feeble sentences before collapsing in a dramatic heap at the top of our stairs and FaceTimed my dad, who - over the years - has become somewhat of a beacon in a creative crisis like this (actually, it depends. Sometimes, he'll listen and consider my panicked rant before staring directly at me through his camera phone lens to say, in a very firm tone, "You're screwed." Which is never helpful, really). "Daaaad," I pleaded. "You must experience this too, right? As an architect? Have you ever had a client ask you for something that you couldn't deliver because you were so mentally ... blocked?" I told him about the mean voice in my head - the one that said I was kidding myself if I thought I could write this piece. My sage, non-word-mincing dad mopped up his egg with a piece of toast and said, "Yeah. You're just overthinking things. They chose you, right? They wouldn't have chosen you if they didn't think you were capable of doing it." And with that, I felt a little better, closing the FaceTime portal between us, and sitting down to write again. On Monday morning, I emailed the article over to the editor. I dreaded her feedback, which I received late Wednesday evening, due to the time difference. When I opened the draft with her comments and annotations, I drew a sharp breath. Nearly every paragraph required revisions. But once I got over my initial shock, I realized that I'd simply been too conservative in my descriptions, and that I needed to provide more detail in each instance. Suddenly, I realized that what the editor had given me was gold. I could use this as a learning experience. I could see what my writing lacked, and rectify it. For the first time, I felt inspired by constructive criticism, rather than let down. My second draft returned a more positive response, which buoyed my confidence. I guess what I'm trying to say that it's hard working alone in a creative role, sometimes. Unlike working in an office, there's no one to immediately bounce ideas of off, or receive feedback from (thankfully, I've got John to read through my article drafts to make sure the language isn't too flowery or, the opposite - too staid). It can often feel very lonely. But it's exciting too. I've always wanted to write. More importantly, I've always wanted to be a better writer. Maybe it's time to start learning how - beginning with this article. This month's travel link-up topic was, "a place that inspired you". And I thought - which place hasn't inspired me? From the antique markets and fresh produce of Bordeaux, to the breathtaking glassy blue rivers and waterfalls of Iceland, to the dusty, frenetic souks of Marrakech - I've left every location we've travelled to in the past five years with a renewed sense of joie de vivre, not to mention, an overstuffed suitcase. It's been over a year since we moved into our house, and since then, we've filled it with treasures from places we've visited. I love that so many of my belongings - from buttery soft leather slippers bartered for at a dusty Moroccan souk to a pretty, silvered brass vase plucked from the highest shelf of Good Earth in Bangalore - are souvenirs John and I chose together in some of our favorite destinations in the world. Seeing them in our house takes us back to those happy memories of basking in the tropical sun on a beach with palm trees overhead, or tucking our legs into a tuk-tuk after a biryani dinner, the driver expertly weaving in and out of traffic to deliver us safely back to our hotel. Are you a serial souvenir collector? We're always on the lookout for a little something to put on our bookshelves, or a new light fixture! This post is part of the April Travel Link-Up, hosted by Angie, Polly, Emma, and Reena. Head over to their blogs for more travel inspiration!